We took a trip to Idaho this last weekend and could not find the Idaho Falls Deaf Branch anywhere in Idaho Falls. The listing seems to have been taken off the lds.org Stakes and Wards listing for Deaf units. 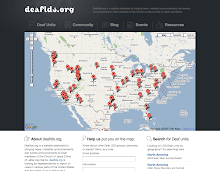 If anyone knows any information about the branch or and Deaf members in Idaho Falls, please contact deaflds.org. Also, we happened to run into an interpreter from the Pocatello Deaf Group who told us about the six Deaf members and four to five interpreters who are part of the Alameda 6th Ward in Pocatello. We hope to hear from them again soon too.